BEIJING – The United Nations World Food Programme (WFP) today welcomed a US$21 million contribution from the Government of the People’s Republic of China to provide urgent food and nutrition assistance to people affected by food crises across eight countries in Africa and Asia. World Aids Day is a day dedicated to raise awareness about Aids and the spread of HIV throughout the World. Globally, an estimated 35 million people were living with HIV last year, and 3.2 million of these were children. The vast majority of people living with HIV are in low- and middle-income countries. An estimated 2.1 million people were newly infected with the virus in 2013. Minister for Foreign Trade and Development Paavo Väyrynen has granted EUR 14 million for victims of conflicts and natural catastrophes from the appropriations earmarked for humanitarian assistance for the last months of the year. The aid will be channelled through UN agencies, the Red Cross Movement and Finnish NGOs. Ten million euros will be allocated to Africa - the Horn of Africa area, East Africa and southern Africa in particular. In the Horn of Africa area, Ethiopia and Kenya suffer from drought and Somalia also from a prolonged conflict. WASHINGTON, D.C. (May 21, 2009) - Thirty organizations commended House Foreign Affairs Committee Chair Howard Berman (D-CA) and the House Foreign Affairs Committee for incorporating provisions to confront child marriage in the State Department Reauthorization Bill. Passed yesterday in Committee, the bill now must be voted on by the House of Representatives. Introduced in the House by Rep. Betty McCollum (D-MN) and in the Senate by Sen. Richard Durbin (D-IL) and Sen.Olympia Snowe (R-ME) earlier this month, the International Protecting Girls by Preventing Child Marriage Act (HR. This map shows earthquake intensity zones in accordance with the 1956 version of the Modified Mercalli Scale (MM), describing the effects of an earthquake on the surface of the earth and integrating numerous parameters such as ground acceleration, duration of an earthquake, and subsoil effects. It also includes historical earthquake reports. Muslim Hands - United for the Needy is an international relief and development organisation, established in 1993 with the objective of providing relief from poverty, sickness and the provision of education on a non-discriminatory basis. We work both directly and with partners in 35 of the world's poorest countries. 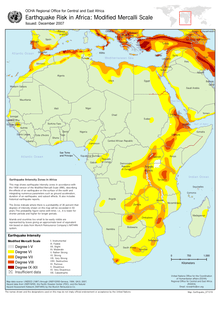 Unusually heavy rains during the months of October and November have turned large parts of the Horn of Africa into flood disaster areas with loss of life, massive displacement, and loss of livelihoods and assets in particularly in Kenya, Somalia, and Ethiopia. Accumulated estimates from the three countries put the total number of affected people between 1, 5 and 1, 8 million. Emergency response has being mounted by Governments in the affected countries, UN agencies, NGOs and other humanitarian partners.